TAKING after A R Rahaman? He no longer needs an introduction to music enthusiasts in the country because his name has become synonymous with music. 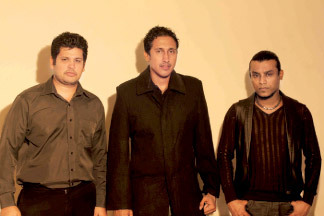 The talented Dinesh Subasinghe is once again in the news with his new music video E Kale: The One . The video encompasses some of the latest technological devices and a handful of award winning artistes in the island. E Kale turns a new chapter in the music industry because of its enthralling images projected with cinematic techniques. “Last year was a phenomenal year for 3D movies. Animations like The Hobbit: An Unexpected Journey, Snow White and the Huntsman, Brave and The Avengers made a huge impact on the box office worldwide. That is what prompted us to make the music video in 3D,” Dinesh explained how the idea took shape. The theme of the video is that of a super hero. Ranushka Fernando and a few other well known faces in Sri Lankan celebrity circles have joined hands with Dinesh in this effort. The video has been viewed by more than 660, 000 people on YouTube during a short span. E Kale is the first official music video released by Dinesh after his stint at A R Rahman Academy where he excelled in the subject. The video is also the second alternative rock music video by Dinesh since he released Mona Lisa with the Dee R Cee members in 2004. “For the first time liquid effects have been used to create monsters for a Sri Lankan production. VFX editor Ranushka of Digital Line Computer Institute used the techniques used by James Cameron and Rupert Sanders,” Dinesh said adding that keeping up with the trends to offer wider ways in impressing his viewers has been his formula of success. He hopes that his latest work will become popular with the younger audience. 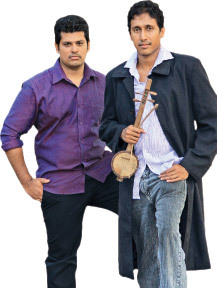 He said that top film personalities like Roy de Silva, Channa Perera, Cletus Mendis, Chandratathna Mapitigama, Sunil Costa, Kanchana Mendis, Duleeka Marapana and Tennyson Cooray have been impressed with the special effects in the video and have recommended it for the international audience. Gihan Sethunga and Dilan who made up the Digital Line production team said that Ranushka brainstormed with them tediously trying to get the best ideas for the project. The did location scouting for days and even test shot before deciding on the best backgrounds for the video. Dananjaya Siriwardhana,Vishwa Kodikara, Rajitha Chamikara (Ping Pong), Suresh Gamage, Niroshan Wijesinghe and Shashe Angeleena were part of the project. The lyrics are penned by Christina Fernando while Trishala Wijethunga voices the female vocals in the song. Charmika Sirimanne had also rendered his voice for the song. Violin and rock music go hand in hand in E Kale. This is a new experience that Dinesh introduced to music lovers in Mona Lisa and now again in E Kale. This form of music has been used in well loved hits like Paul McCartney's Eleanor Rigby . Dinesh notes, “According to my point of view there is no such thing as experimental music. It is only a distinction between the stereotyped and invention. You need to recognize what caters well into the mass market and the pulse of the audience. The music video is telecast on all the leading television channels, Facebook music.lk and YouTube. It has reached the most popular video category and is ranked number two on the Derana TV website. It is also being shown on Hada Randi Paya on Swarnavahini, Back to Back on Derana TV, Juke Box and Music Online , Ridma Tharanga on TNL and Rekhawa on Sirasa TV.